The engineering of skin substitutes and their applications on the regeneration of damaged skin have advanced dramatically in the past decades. However, scientists are still struggling with the generation of full-thickness skin with native structure and completed functions. 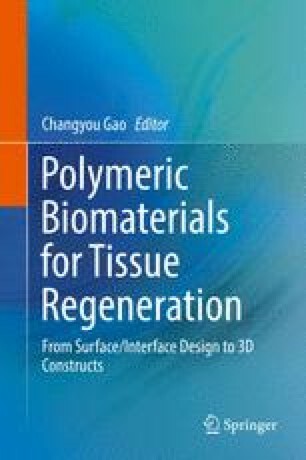 In this chapter, classified by sources, recent developments of biomaterials for skin regeneration have been summarized. Then the most common formats of the engineering skin substitutes are introduced. The strategies of the biological functionalization in the design of skin substitutes are further summarized. Some important challenges in the field of skin substitutes such as angiogenesis, scarring, and appendages loss are particularly focused on. Finally, a brief conclusion and some perspectives are given in terms of the future trend of biomaterials for skin regeneration. We acknowledge financial support by the Key Science Technology Innovation Team of Zhejiang Province (2013TD02), the Natural Science Foundation of China (51322302, 20934003) and the National Key Research Program of China (2016YFC1101001).